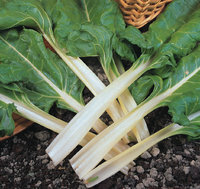 Also known as Swiss Chard, this is becoming very popular with several colourful cultivars. Sow in situ, not too early, from mid April to June. It can be cropped over a very long period from August, over the winter and into the spring; for cooked or salad use. This is a delicacy: excellent flavour and texture from both the leaves and the thin pale green ribs. You can grow this as a cut-&-come-again crop for salads but do leave some plants to grow on and enjoy at a larger size when cooking will bring out its sweetness. Price for 40 seeds. With its large leaves and broad white ribs this traditional variety cannot be overlooked. It is a vigorous grower and will cope with whatever the summer weather throws at it until autumn frosts become penetrating. Should you have any of your bountiful crop left-over than your pet chickens and rabbits will also appreciate it. Price for 40 seeds. Be dazzled by the magenta stems, midribs and veins set against the crinkly dark jade green leaves. The flavour remains mild even at full size. Grow and harvest young for stunning salads in the summer then brighten up your autumn/winter garden (and meals) and let the plants reach 50-60cm tall . Price for 40 seeds. No prizes available for guessing that the delicious shiny dark green leaves have ruby red ribs and stems! It is very ornamental but the mild flavour makes it a kitchen favourite too – I love it with garlic cream mushrooms, I have also used it on pizza, in soups and it’s probably needless to say it’s perfect in salads. Price for 40 seeds.